I was browsing through the Kickstarter games section last night and stumbled across an interesting little project by Lester Smith. If you aren’t familiar with Mr. Smith, he was the co-author of the Planes of Chaos boxed set for TSR’s Planescape setting, and the editor of Gary Gygax’s Dangerous Journeys RPG (and the supporting magazine) – Gygax’s creation after leaving TSR. 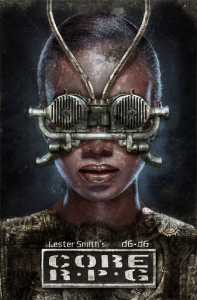 Mr. Smith has also been involved in Traveller, Sovereign Stone, Deadlands, and a number of other RPG-related projects. 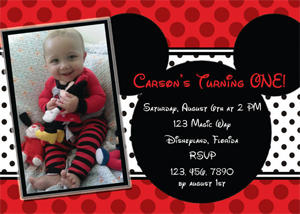 Currently, he is the president of Popcorn Press, producing eBooks and card games. His latest project is a new lite-on-rules RPG called d6xd6 CORE, which is currently in the middle of its Kickstarter campaign. The character sheet for the CORE RPG fits on a single business card (and in fact, backers of the project at the $9 level and above are receiving a sample as one of the completed stretch goals, and more can be printed on business card paper or ordered as Kickstarter addons). The game adopts a single stat : Focus. The more diversified a character’s skills are, the lower his Focus. The lower a character’s Focus, the harder it is for him to be particularly good at any single thing. 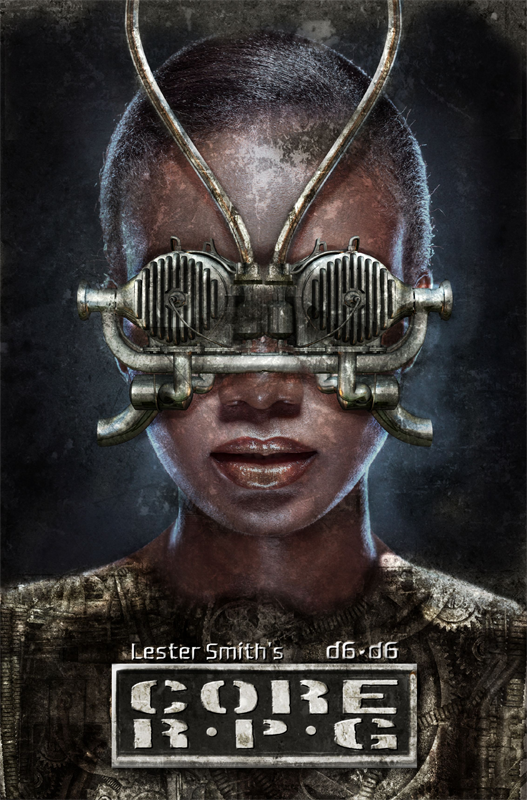 The really interesting thing about the project is that the CORE RPG rules are meant to be easily incorporated into pretty much any setting, and Mr. Smith has worked with a number of authors of popular fiction novels and series to incorporate their settings into the CORE RPG book that will result from the Kickstarter campaign. As of this writing, eight settings have been “unlocked” via stretch goals, including the Watershed setting by Douglas Niles (really good books if you haven’t read them, by the way!) The funding is approaching the unlock point for four more settings, these all being Sci-Fi themed (though all pretty varied under that heading). Beyond that, an additional 12 settings are lined up as stretch goals at higher levels, including a 4-setting Horror pack, an urban fantasy pack, and a “laugh pack” consisting of four humorous settings. Additional “secret” packs are also in the works beyond the currently defined stretch goals. I’m in for the print version 🙂 Hop on over to the Kickstarter campaign and help unlock the additional settings so I can have ’em! One of the coolest things about the Kickstarter trend is that is has given us a resurgence of the “old-school” cRPG. Pillers of Eternity, Wasteland 2, Shadowrun, Torment: Tides of Numenera – just a few years ago, games like these had all but disappeared. It seems like every new (non-indie) game was a derivative of a first-person shooter (not that there aren’t some really good games in this style). Divinity: Original Sin is a new party-based cRPG that was funded with Kickstarter, and saw it’s official release on Monday (June 30th, 2014). I had missed the Kickstarter campaign, so the official release was my first chance to get into and play the game. So far, I’m pleased to say, that while the game is not without issues, I am very much enjoying it. Anyone used to the toned-down, hold-your-hand style that many modern RPGs have adopted will be in for a shock playing Original Sin. 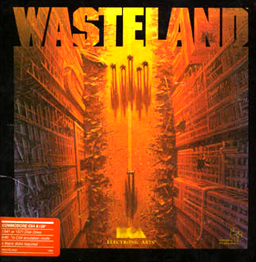 If you played the original Wasteland, you might remember that the game was completely open. You could wander anywhere you wanted to right after leaving the Ranger Center. Even if that meant walking your level 1 characters into a group of enemies that could grind the entire party to dust without noticing you were there. Original Sin adopts the same kind of freedom. When attempting to leave the city during the beginning of the game, the guards might suggest that you appear to be unfit to survive in the wilds, but they won’t actually stop you. While you can use the environment to your advantage (more on that in a moment), your enemies will do the same, inflicting all manner of painful debilitating effects on your party. All of this, though, is a good thing. You can tone down the combat difficulty (slightly) by going into easy mode – which is still no cake walk – but making strategic use of your abilities is a must if you wish to survive for long. Setting things on fire with a fireball – and a poison cloud triggered by killing a zombie. 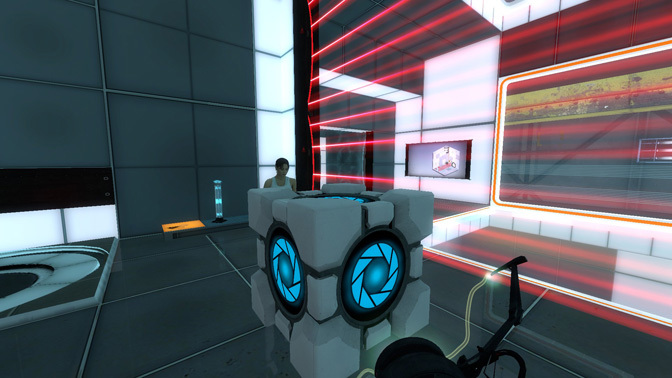 Lots of objects in the game world can be manipulated. Barrels and boxes can be moved to clear paths and block off noxious vents. Paintings can be stolen off the walls of houses, and items in the world will react to damage by shattering, burning, exploding, and what have you. This is a nice change from the totally static world-as-backdrop we see in many games these days, but Original Sin goes a step beyond these interactions. Surfaces in the game can be covered with various effects – fire, water, ice, poison, etc. These surfaces will not only convey effects for characters (player and non-player) standing in them, but will also react realistically with other elements. For example, a rain storm can put out fires and make areas (and creatures) wet. You have options for following that up. Use a cold-based spell on a wet monster and you have a chance to freeze them, denying them actions until they thaw out. Or, you could shoot a fireball into the puddle, creating a scalding cloud of steam. You might also fire a lightning bolt into it, zapping everyone standing in the water. Using the environment to your advantage is critical to surviving combat – and it cal also be fun to pick up an enemy with your teleportation spell and drop them into a lava pool – unless they are healed by fire. Much like the Elder Scrolls games, the classes that exist in Original Sin are just templates of pre-selected skills. You can use them as a starting point, or throw them out completely and make your own choices for the character(s) you create (if you are playing in single player mode, you create two heroes). Advancement works the same way. Put your points wherever you feel they will be most useful. My current party consists of a wizard and a rogue-turned-ranger. I’ve picked up two companions – another wizard (more healing focused) and a warrior. I hadn’t planned on creating a ranger at all, but when I ran across a mighty fine bow I dropped a point into Bows and never looked back at one-handed weapons again. 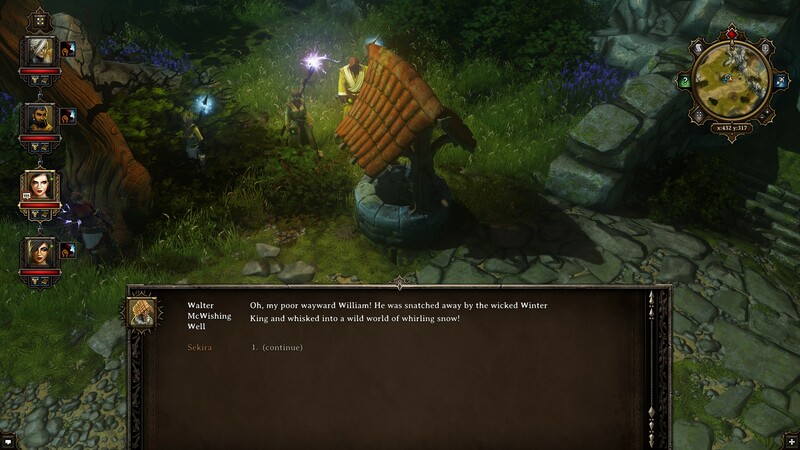 Larian has certainly not forgotten that we are playing a game here, and they have sprinkled some bits-o’-weird throughout the game. There is a quest in the middle of the starting city which as you chasing after a lost cat collar so that the cat that lives at the inn can impress the mayor’s cat – did I mention there is a skill called Pet Pal that lets you talk to animals? Little bits of odd are scattered throughout the game, and can often make for an unexpected laugh when they show up. No more spoilers here, though – they are more funny when they show up out of the blue. 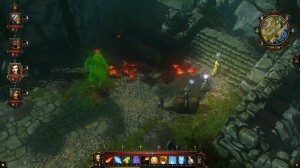 Bundled with the game, Larian has included “The Divinity Engine”, a powerful editor that allows users to create their own games with the D:OS engine. I’ve only barely looked around in the editor, but it appears to be jam-packed with features, so it is likely we will begin seeing fan-created campaigns down the road. Having this functionality built into the game also leaves open the door to future official campaigns as well. Divinity:Original Sin is a great game, but that doesn’t mean there aren’t a few things I would love to see changed. For starters, a pause button in single-player would be nice – or at least an option to have all of your characters STOP MOVING when one of them shouts out that they see a trap. The in-combat controls are generally good, but I would like the option to not automatically end my turn just because I ran out of action points. The way the game is set up, you can press the space bar to end your turn and save any remaining action points for the next round. This is great, because some of the more powerful spells require more AP than you generate in a single round to cast. Unfortunately, it is too easy to not realize you have used your last action point and hit space bar during the delay when the game automatically ends your turn and switches to the next character, causing them to end their turn. Not game breaking (just have to pay more attention) but an annoyance that could be fixed with a simple toggle option. There are a few minor camera issues as well, though it doesn’t come up too often. In some outdoor areas the tree canopy doesn’t fade out properly so you end up looking down at a thick tangle of weeds unless you zoom way in, which makes getting an overview of the battlefield difficult at times. Again, though, this doesn’t happen all that often. None of these are game-breaking, and in fact are annoyances at most. Overall, the game has been very enjoyable. The fifth edition of the Dungeons and Dragons rules (sometimes known as D&D Next) have been in development for couple of years now, with a wide-spread “playtest” taking place beginning in May of 2012. Today saw the official release of those rules, and better still they have been released as free PDF files for everyone to download and enjoy. The free PDFs, labeled as the D&D Basic Rules, represent the essentials for playing the 5th Edition game. Included are four classes (Cleric, Fighter, Wizard, and Rogue) and four races (Human, Dwarf, Elf, and Halfling). Each of the classes details a single archetype, or subclass, though the introductory text for these sections indicates that there will be a number of these types of archetypes to choose from for each class. Kotaku had a post the other day: The Moment that Changed How I View Music in Games. When I saw the title, my first though was that for me, it was the Opera scene in Final Fantasy (3 or 6 depending on if you use the English or Japanese numbering of the titles.) I was pleasantly surprised to open the article and find that the author was talking about exactly that. For those unfamiliar, the article above goes into good detail about the sequence, but in short there is a portion of the game where you are tasked with learning a song for an in-game opera (unrelated to the rest of the story) and “perform” it by selecting subsequent lines of the lyrics. This was long before the days of voice in games, but the developers did a fantastic job of actually making it seem like the song was being sung by the performer (considering the hardware available at the time!) In the twenty years since what I played as Final Fantasy III on the SNES was released, I still occasionally find myself humming Maria’s song. When it comes to games, music seems to fall into a handful of categories. First there are the games where the music either really fits well and is used at the right times. To me, these are games like the Ultima series (you can listen to many of the Ultima tunes at Auric’s Ultima Moongates) and the Morrowind, Oblivion, and Skyrim games (music by Jeremy Soule – you’ve no doubt heard music composed by Mr. Soule, as he has composed music for just about every kind of game you can think of.) If I pop in a CD with the theme from the Plane of Time (EverQuest) on it, I can easily recall countless hours spent in that zone. By the same token, I know that most of my guildies in EQ had turned their music off a few days after starting to play the game. That’s a shame, because some of the music was very good, but it also got pretty repetitive at times. That is a danger in any MMO though, where the developer does not really have any way of matching the pacing of the music to the action happening in the game. The second category of game music, to me anyway, is music that fits well in the game but goes almost unnoticed by the player. This is good in some ways – it doesn’t distract the player from the game – but it is almost like a movie score. It is there to support what is happening on the screen and not meant to overshadow it. As such, if you remember it at all it is on a subconscious level. Third would be rhythm or music based games. In these games, the music is an obvious attraction and may be popular music being used as the basis for the game (Rock Band, Guitar Hero, etc) or perhaps original or generated music integrated into the game, along the lines of the Bit.Trip series. In both types of games, the music is fundamental to the game, though in the case of the former you may not associate the songs with the game – you already know the songs. Finally, there are games where the music just doesn’t seem to fit. I’m not going to call out any specifics here, but we all know games like this, where the music is best turned off and left off. For the indie developer, when working on a game, music is nearly a requirement these days, and finding or generating good music can be quite a task. If you are a small (or one person) team, you need to not only be able to write the code and generate the graphics, now you need songs too. One source I’ve found for music for my own projects is OpenGameArt.org – one of my favorite sites. Yup, OGA contains not just graphics, but music and sound effects too. There are some really talented people uploading music to OGA, that fit any number of genres, to 8-bit chiptunes, fantasy scores, and sci-fi inspired music. Many of the tracks have been released as CC0 (Public Domain) and can be used in anything you want to create. Others have non-PD but generally friendly licensing terms – be sure to check the licenses before you include them in your project – but definitely take a listen. There’s a lot for you to see and do throughout the game, but you don’t have to follow any single path for success. There’s plenty of room to goof off in this game. So don’t sweat it if you don’t know what something is used for — you might not even need it to win. But don’t make too many judgement errors too many times, or victory will slip farther and farther away. We can’t make it too easy to win, after all. After you finish Wasteland the first time (for which we congratulate you), you can go back and check out all theplaces you didn’t get to fully explore the first time through. Play it again; try things a different way. It’s not over when it’s over. I doubt that, at the time, the writer could have possibly envisioned the way that final sentence – “It’s not over when it’s over” – would manifest itself. Or that it would be twenty six years before it did. I have played pretty much all of the major MMORPG releases, if not at retail then at least in betas. While not the first MMO I had played, EverQuest was certainly the one that is the most memorable for me. I started on release day (March 16, 1999) with a group of local friends that had all decided to buy the game based on the excitement one of our number expressed while participating in the beta, and had soon formed a guild that became one of the top dozen guilds game-wide in the pre-World of Warcraft days. 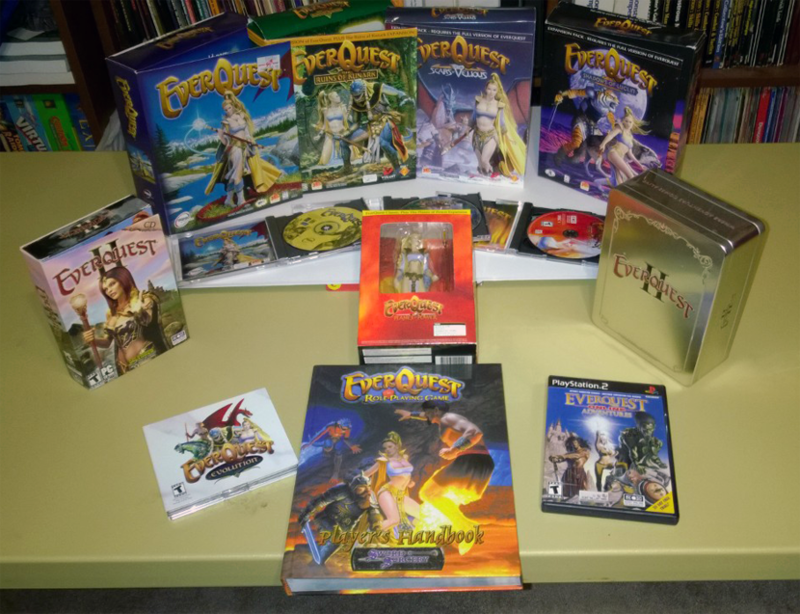 In the 15 plus years since its release, the original EverQuest has seen 20 expansions. As a guild, we retired around the time of the Dragons of Norrath expansion (Early 2005) and moved on to other things. Some of us played EverQuest 2 (released in November 2004) for a while as well, which probably contributed to retirements from the original EverQuest. Last month (April 2014) Sony Online Entertainment changed up their All-Access subscription, dropping the price and adding EverQuest, EverQuest 2, PlanetSide 2, DC Universe Online, and Dragon’s Prophet to a single subscription. Also included when they are released will be Landmark and EverQuest Next. At some point over the years, Sony had converted their games to a free-to-play model, introducing an in-game store selling items and features for real-world cash. I had popped back into both EQ and EQ2 a couple of times over the last decade to see how things looked, and with the revamp of the All Access pass, I decided to reactivate my subscription and take the old games for a spin. The Humble Store is running a spring sale from May 6th through May 21st, with some pretty good savings on a number of games, including some recent titles like Thief and South Park : The Stick of Truth. 10% of all Humble Stores go to charity, and their weekly and roughly monthly pay-what-you-want deals are usually pretty good for picking up games and occasionally other items (right now the main Humble Bundle is a set of digital comic books). Most of the games net you Steam keys, so you will need a Steam account to redeem them. 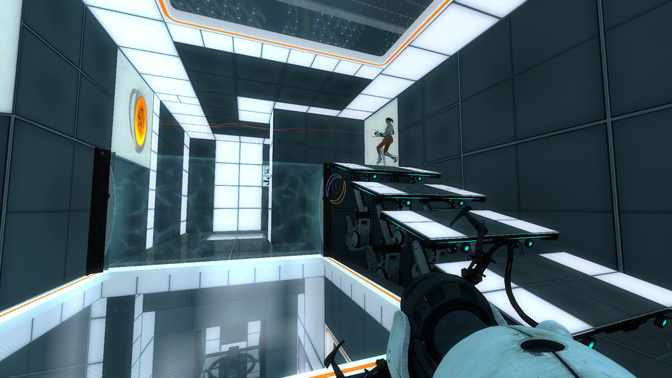 Portal and Portal 2 are very near the top of my list of all-time favorite games. 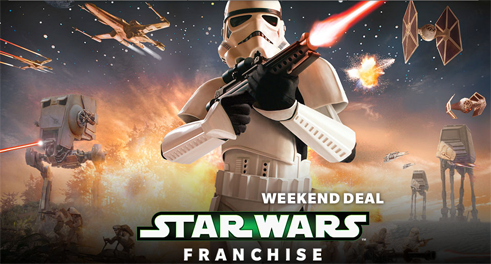 The original game was simply so well done that I was overjoyed when they announced a sequel. Even though the second game was considerably longer than the first, I finished Portal 2 in a single sitting, and have gone back through it several times. I’ve also played all of the co-op levels with a friend. One of the primary mechanics in TWTM is recording yourself crouched by a wall you would not normally be able to jump to so that you can replay yourself doing so and jump onto your own back and up onto the ledge. This is the first mechanic you learn in the mod, and one that is used extensively throughout, but it is by no means the only one. You will need to have your clone do things like pick up cubes and bring them to certain locations where you will later come along and take them from her. Since objects like blocks and spheres, and the environment, are not effected by your personal time machine, you need to make sure the circumstances for your clone interacting with them are correct before replaying your actions. Press “R” to start a recording, and “Q” to end it. Balls don’t necessarily observe the rules of gravity as we understand them. Chamber 5, I’m looking at you! While a bit short (the test chamber numbers go up to 9, though the last one doesn’t involve much other than a cutscene), TWTM is a very enjoyable mod. The difficulty progression seems about right, and while there are occasionally areas where timing is important, it never really becomes a “twitch” game, making thinking through the puzzles the primary challenge rather that needing to jump at exactly the right second from exactly the right spot. The author has hinted at the possibility of a way for others to make TWTM levels, but hasn’t released anything along those lines yet. I would love to see the mod expanded upon with new chambers. A Kickstarter user by the name of Leo Atreides from the UK has a project that is about halfway through the funding period to produce “rollable” four-sided dice. 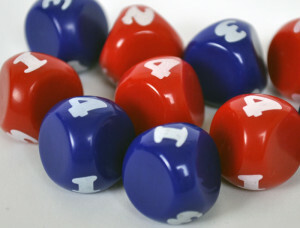 I’m not certain I actually need a differently shaped d4, but they do look sleek. You can visit the Kickstarter campaign to learn more or back the project.